A Watt steam ingine. 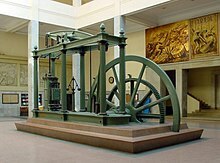 James Watt transformed the steam ingine frae a reciprocatin motion that wis uised for pumpin tae a rotatin motion suitit tae industrial applications. Watt an ithers signeeficantly improved the efficiency o the steam ingine. The Industrial Revolution wis the transition tae new manufacturin processes in the period frae aboot 1760 tae sometime atween 1820 and 1840. This transeetion includit gangin frae haund production methods tae machines, new chemical manufacturin an airn production processes, improved efficiency o watter pouer, the increasing uise o steam pouer, the development o machine tuils an the rise o the factory seestem. This page wis last eeditit on 10 Februar 2016, at 18:23.